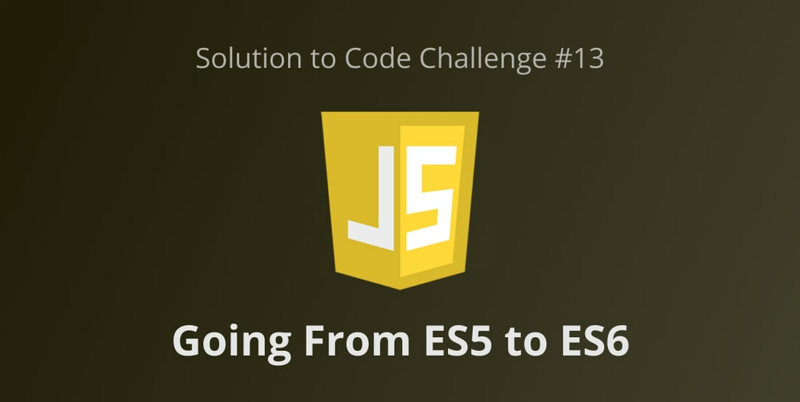 Last week on the code challenge #13 we looked at converting sample code in ES5 to even simpler and more readable code in ES6. Yet to take the challenge? You can check it out here. In this post, we shall solve the challenge. Awesome entries for the challenge can be found in the comment section of the post, on Twitter using the hashtag #ScotchChallenge and on the Spectrum forum. In this challenge, we are presented with a set of 5 different code pieces requiring a re-write using a key ES6 feature. We would go over these individual challenges and the solution for each shortly. However, we were provided with boilerplate code written in ES5, we shall go over that briefly. Looking at the script in the pen above, we can see the individual ES6 syntax requirements requested. Using enhanced object literals, we no longer need to define the key and property of a returned object if its values are picked from the function&apos;s arguments. Also, it presents a cleaner way of writing methods. This largely reduced the number of lines written from 13 to 5. Note that in destructuring, new variables are created whose names are the same as the source object&apos;s keys and the value corresponds to their individual source values. The spread operator is the 3 dots before the variable name. This returns a multi-line string value with interpolated variables. Running each script would provide the same result as the base codepen.